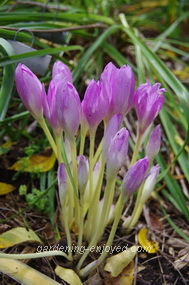 Dallying In The Dirt, Issue #142 ---The autumn blooms of Colchicum have burst open. This appears to be the second week in a row that Friday’s “Dallying” is being written on Monday morning. We’ll make every effort to get back to Friday morning. If I’m giving you ideas of what to do in your garden, they are probably more useful before the weekend rather than after it. My garden was ignored these past few days while we went grandparenting in Ottawa. Great fun. I need to report on something I mentioned a couple of weeks ago. I have twice sprayed my Tuberous Begonias with a 1/9 milk /water solution and the results have been wonderful. It patently cannot cure any damage done but it has certainly stopped the advance of the fungus, allowing me to enjoy these beauties for a few more weeks until the frost finally does them in. I will be starting it earlier next year. It’s starting to be one of my favourite gardening seasons. The front porch is covered in spring flowering bulbs that I will be planting over the coming weeks. You might even get tired of listening to me rave about the wonders of bulbs. The results of previous year’s efforts are now evident in the garden and encouraging me to get busy. Large clumps of Colchicum are springing up in a few spots and adding much needed bright new colour to the autumn garden. I’ve already planted several new white Colchicum this week and a few yellow Sternbergia and hope to see both of them produce flowers in the next week or three. Pay the big bucks for a Colchicum bulb, the picture is a clump that has grown from one bulb planted a few years ago. After I finish writing this I will be adjourning to the kitchen. I picked a large bag of Eggplant yesterday and they are downstairs calling my name. One of our favourite uses for Eggplant and one of the best ways to store them for the winter is to make Eggplant patties. I make a large batch of the batter for these flavourful delights. We’ll have some for dinner tonight and the rest will get frozen in ice cube trays to be defrosted and fried throughout the winter. I love serving it to people who profess to detest Eggplant and then telling them afterwards, what they have just admitting to enjoying. It is supposed to get warmer by the end of this week and that will take away my reason for procrastinating. The ponds are overflowing with vegetation. The Water Hyacinths have multiplied greatly. The Lilies have produced great leaves and a delightful number of blooms. Left to nature , all of that vegetation would be killed by the frost and then sink to the bottom of the ponds. In nature that is a good thing; it enriches the silt at the bottom of lakes and rivers. In a small closed pond, it’s a different story. All of the decomposing vegetation gives off a lot of gases. When the ponds freeze over it’s difficult for that gas to escape and it becomes toxic to the fish. I will be in there later this week cutting back and composting as much of that vegetation as I can reach. Later in the fall, the bubblers will go in the pond to provide some oxygen for those fish. Mary Asks? can you tell me please why our smokebush doesn't smoke?? We get the buds that make it look like it's going to smoke, but that's where the tree stays - no beautiful cotton candy tufts. Ken Answers! The opportunities for humorous responses are too obvious. There are a number of possibilities. It does not do well in hot climates and performs better in some shade in such situations. It blooms on old wood, so if you are pruning in the spring you are pruning off the flowers. Jim Asks? Grew Coleus for first time from seed and colour and foliage is excellent. Do I cut them right back for the Winter or let them die down? Seems a pity to do that right now as they are providing more colour than anything else. Ken Answers! Keep on enjoying them as long as possible. They are treated as an annual in temperate climates and the first hard frost is going to kill them. It is possible to take cuttings or transplant them to a pot and grow them inside during the winter. 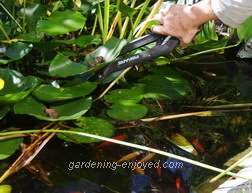 Fresh cuttings taken during winter could give you new plants to put out next spring. They get quite large and woody in their native Malaysia. Susan Asks? I enjoy your knowledgeable articles. Do you know what attacks crabapple trees. We live in Nova Scotia now but I've had the same problem in Ontario. They leaf out & bloom beautifully then over the course of the summer they lose leaves. At present in mid-September before any frost they have almost no leaves but the apples are still on them. they are a small fruited variety, the kind even the birds don't seem to eat with a dark maroon leaf. I have top-dressed the root area with composted manure the last 2 years. Any help would be appreciated. They are so pretty in the spring I'd hate to lose them. Ken Answers! Some Crab apple varieties are more trouble than others. Mine is still in full leaf even as I pick the fruit out off the ponds. The most likely culprit is apple scab fungus Venturia inaequalis. The answer is to grow scab resistant varieties of which there are several. Spraying is an option but not terribly practical for a home gardener. The fungus overwinters on the fallen leaves, cleaning them up thoroughly will be some help.